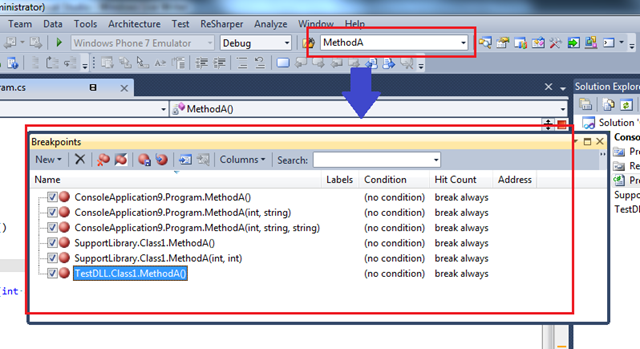 Visual Studio having great features to set breakpoint in multiple functions at same time. For most of the time, to set a breakpoint with in a function you just put a breakpoint in the first line of the function. Now, assume you have 10 different overloaded methods or you have same function in different project, and you want to put breakpoint all of them or few of them, then it will take time to put breakpoint in each and every function. In this post I am going to share two quick tips by which you can set breakpoint to function very easily. first one is by using “Break at Function” and second one by “Using Find Combo Box”. You can use break at function window from Breakpoint Window where you can give the function name, it will automatically show you the all function name that are matching with the name and will put the breakpoint. Where it will show you all the function name and from where you can select the function where do you want put the break point or select All if you want to put breakpoint to all of your function. Now, you may think, what about multiple project, yes, this will work for multiple project as well. If you have multiple methods with same name in different project it will retrieve all of them and will put the breakpoint on the selected method. Note : You have to make sure,in function break point window, you have checked “Use Intellisense to verify the function name” because, based on the Visual Studio will select the functions. Now here is the second and Interesting tips. Summary : In this post I have shared two easiest to deal with breakpoint in function. Hope this will help you. Previous Entry How to use out of scope object with in Conditional Breakpoint ? Petr. Thank very much !! 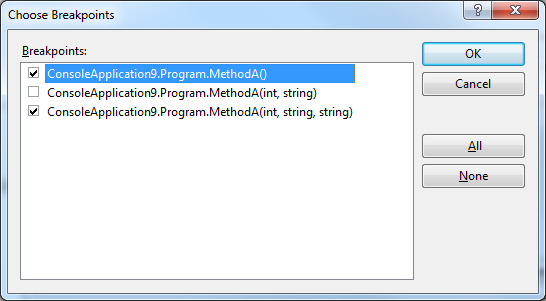 How to make it work for C# Project. This works on with C++ projects. Example is shown in C# project only. or are you asking other way around.